This picture is from last Saturday. It was Nate's 8th birthday and we got him a guitar to celebrate. 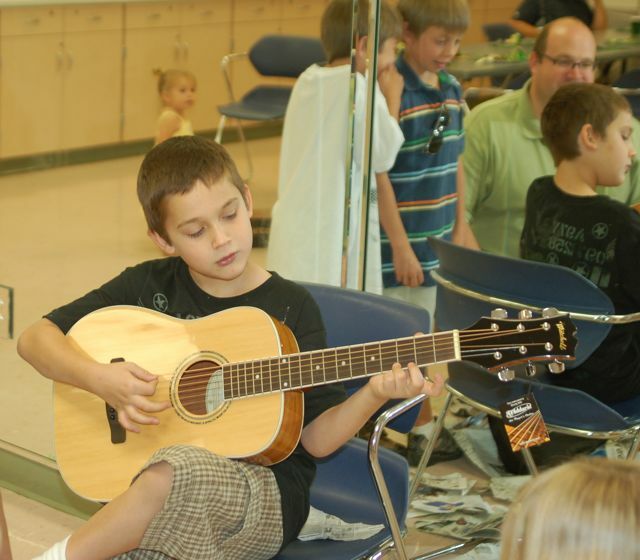 This child has always loved music, and has expressed a desire to play guitar for a couple years. Bo found this guitar a few months ago and knew that Nate should have it. Now to find him a good guitar teacher! Our sweet boy still loves being outdoors, music, and all things military. He is thoughtful, kind and quick to smile. He is frustrated some days by having a little sister around, but he loves her fiercely all the same. The bond he and his brother have is tight. My darling boy is extremely under the weather today, so thoughts of good health would be wonderful. He was supposed to have his well-child visit this morning, but it turned into a sick-child visit when he woke with a 103 degree fever. It appears he just has a really nasty sinus infection, as a trip for chest x-rays showed clear lungs (chest pain most likely caused by a strained muscle) I'm hoping a good, long sleep will do him well and he'll wake in the morning starting to feel like himself again.